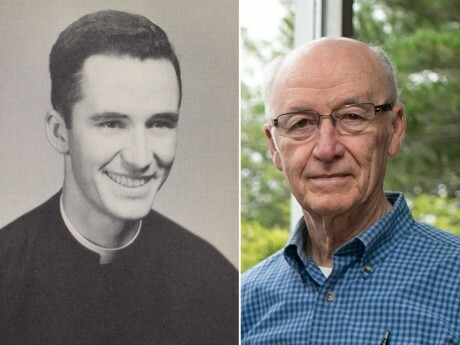 As the College prepares to celebrate its 70th anniversary, Professor of Religious Studies Thomas Clarke, who graduated from Stonehill in 1957 and has been teaching here since 1969, reflects on his student days, the professors who nurtured and challenged him, and the changes that have occurred between then and now. In 1948, the Holy Cross Fathers founded Stonehill College. That same year, a Holy Cross Father came to my school in the Bronx to speak to our class about studying for the priesthood. He did not speak of Stonehill, however. He told us that we could go to Notre Dame to study. In a flash, I was home that day and told my parents that I was going to Notre Dame to study for the priesthood. They did not take me too seriously, but in September, 1948, they took me to Grand Central Station where I boarded a train for South Bend. Though I was at the high school seminary across the lake from the campus, every event at Notre Dame was open to the seminarians. We attended rallies, football games, the theatre, lectures, concerts, and the like, as if we were students at the university. At the time, Notre Dame went undefeated in four seasons under Frank Leahy. Heisman winner Leon Hart, College Hall of Famers, Six-Yard Sitko, Bob Williams, and Jerry Groom, and other team members came to the seminary rec room to talk football with us. Life at Notre Dame was really exciting. At the end of my fourth year, Father John Lucey, who taught Latin at the seminary, was transferred to Stonehill College where he became Academic Dean. Before he left, he told me about this new college in the East, and he spoke to me about going to Stonehill instead of staying at Notre Dame to attend college. He thought that as a student from the East, it made more sense for me to be there, so I opted to return to the East. Before attending Stonehill, however, I was sent to Bennington, Vermont where seminarians from Stonehill were making what was called a “novitiate,” a year of religious formation. Here I had my first encounter with Stonehill students. They were all memorable personalities who were very uninhibited in how they spoke humorously about life in the novitiate, and they were clearly eager to return to Stonehill. They made me look forward enthusiastically to my studies there. He continued driving across a vast field and parked by a long low white building that had been a barn for milking cows but was now being turned into a dormitory at the end of which was a hay loft that became a chapel. The next morning, there was a knock on my door, and a rough unshaven fellow introduced himself to me as Brother Peter. I was assigned to be his assistant. He ran the farm. He told me to go with him. That is how I began my student days at Stonehill. For the next four years I worked with Peter on the farm. I helped him set up the chicken coops, build the pig pens, milk the cows, plant and harvest the vegetables, cut the hay and stack it in the large hay barn across from the cow-barn seminary. Every Saturday, we killed and plucked chickens for the seminary meals, on occasion, we slaughtered a pig. I got my first inkling that I was getting a good education at Stonehill on the day that Peter asked me to help the veterinarian who had come to castrate a young calf that one of our cows had recently delivered. I was anticipating a bloody mess, but he took out a large pincers and castrated the steer. Amazed, I said to him. “You mean, you simply have to sever the vasa deferens to castrate him?” The vet was astonished by my question, and he asked, “How did you know that?” I had to know that for a biology test that Doctor Reedy had given only a short time before. He was impressed that I had been held to such detail in an introductory biology course. The first building constructed on Stonehill’s lower campus was a cow-shed that Peter and I built so we could milk the cows without bringing them back to the barn. When O’Hara Hall was built, I received a letter in Rome from Father Lucey apologizing for the destruction of our cow shed. I wish I still had that letter. Near the end of my senior year, I developed a bad cough that would not go away. I was sent to a doctor in North Easton who spent some time talking with me about Stonehill. In the conversation, he remarked that he was shocked by the poverty of the place. I had some sense of what he meant. As a student who was also a member of the Holy Cross community, I knew that we used to borrow Helen Derby’s dishes when the bishop was coming for graduation, and we had to auction off the furniture that the Ames family had left in the Attic, and the Mission Band went throughout the East giving missions to support the college, and local businesses, such as Carrigg Monuments and W.B. Mason, were asked to help us. I was aware of the Buck Board in the cafeteria where a student could take a dollar for lunch on condition that he or she replace one later. Students were happy to get some roll-your-own cigarettes that we made on a little roller with canned tobacco. What I remember most about that conversation, however, was his advising me not to stay associated with Stonehill. As a young person I would be foolish, he said, to throw in my lot with a place so lacking in promise. Shortly after, I graduated and was sent to Rome. On my way to Rome, I found myself on a ship with Fulbright students from all over America as well as with a group of Holy Cross seminarians from Notre Dame. None of the students had ever heard of Stonehill. Even the Notre Dame seminarians had no awareness of the College, but they were as enthusiastic about Notre Dame as I had been when I was there. They spoke endlessly about all they had been exposed to, and I listened. When classes began at the Gregorian University where we were sent to study theology, I remember vividly coming out of class and being asked by my Notre Dame classmates if I had understood what the lectures had been about. They had not, but I clearly had had no difficulty. At Stonehill, as a philosophy major, we did not have textbooks. Father Sullivan had us reading the actual works of Thomas Aquinas, and I was more than prepared to follow the lectures. Michael Novak had graduated from Stonehill a year before me, and when I arrived in Rome, he took me under his wing. His remarkable days at Stonehill had enabled him to become a member of an inner circle around Bernard Lonergan, the leading philosopher and theologian at the Greg, and he insisted that I join the circle. When I returned to the States after graduating from the Greg, I went to Columbia University. One day, a Stonehill graduate who had come to Columbia to study chemistry looked me up, and she expressed some anxiety about being at Columbia after her years at Stonehill. I remember asking her if she had studied with Mary Alice Moore, and she said that she had. “Don’t worry a bit,” I told her, “you are better prepared than the students from the big universities.” Some weeks later, she returned to tell me that I had been right. That is what I remember most about my days as a student at Stonehill. I had had tremendous teachers. Not people who published and focused on their own careers, but professors who worked with us. Doctor Burns never came to class without articles cut out of journals that he directed to specific students because he knew their interests. Father Lockery insisted that we learn science if we were to have any credibility in our world, and he bent over backwards to make it possible for us to do so. Professor Cleary overwhelmed us with so much historical material, that if we stopped to blow our nose, as one student put it, we missed a century. Professor Wiles made us understand the role of finances in every decision, and Father Keena was adamant about the importance of writing clearly, if not eloquently. When I returned to Stonehill after grad school as a member of the faculty, the same spirit was still alive. Frank Ryan and Chet Raymo were talking about Heuristic Studies; Nancy Carrigg was holding seminars on Heidegger in her home; Bob Goulet led the Gouletians who argued over critical theory in the faculty room; and Jim Kenneally was insisting that we take Women’s History seriously. The students closed down the College in protest over the Vietnam War and held “teach- ins” at which they debated American Foreign Policy. Boston’s Channel Five reported the News at Five O’Clock at which the reporter spoke of his amazement at the heated debates that he witnessed at Stonehill. “A student rose and spoke passionately against the war, and the entire student body applauded; then another student rose and spoke passionately in defense of the war, and the entire student body applauded.” He had never seen such affable yet articulate students. Bill Braun, Assistant Dean of Students, founded the Living Learning Center at the seminary on the edge of campus where “The Making of the Person,” the motto on the flags that now line the roads at Stonehill, was taken very seriously. The years went by, and I never noticed. Now, when I drive onto campus, I cannot miss the College. In every direction I look, it is everywhere around me. Where once there were only woods, swamps, un-mowed fields and our milking shed, there are now beautiful buildings that express a coherent style. I am in a daze as I walk around campus aware of what was then and is now. If anyone had said to me that first morning that I crawled in the grass at the foot of the hill to avoid Father Boland’s wrath, “look around, in seventy years this entire estate will be covered with seventy buildings,“ I would not have believed it. I am happy that I did not believe the doctor who thought it would be better to seek a future in a place with greater promise. So now I wonder what the next seventy years will bring. Will our hundreds of acres be enough to hold it all? I confess to exaggeration, but when you are dazed you get that way. Celebrate the legacy of our Founders and the impact of the College on countless lives, both on campus and in the community.